We're Spreading God's Love One Boat At A Time! A variety of details make the participants of a Fish for Life trip feel extra special! Details such as “Red Carpet” introductions, literally. Before each child boards the boat, they will be introduced with a brief bio that they supply prior to the trip. The child and parent will walk (or roll if in a wheelchair) down the boat ramp on a red carpet wearing their new Fishing for Life T-Shirt as they are greeted by the Crew, Fishing Team Leaders and Food servers who make them feel very welcomed. Once aboard, the kids are grouped into teams and assigned a “Fishing Team Leader” who is an experienced and loving fisherman and will be responsible for his or her every need throughout the trip … but most of all will help them catch fish! The Captain will announce the voyage destination and the First Mate will explain how to use the issued fishing equipment, teach fishing techniques and display how to use the bait selection available. He will also describe fish common to the area, and a variety of tips helpful to increase the odds of catching fish. In addition to a complimentary lunch, volunteer young adults also serve appetizers throughout the trip to make our guests feel extra special. Upon returning to the docks, the crew will clean all fish caught that will then be ready for the frying pan! Before we dock, trophies are awarded to each child one at a time by their respective Fishing Team Leader who will acknowledge to the crowd something special they caught and any nice thought to honor them individually. The model for this type of a fishing trip makes kids with special needs feel very comfortable among their peers and very loved by all the volunteers. The Fish for Life home port at the Dana Wharf in Dana Point and we use the vessel “Dana Pride”. 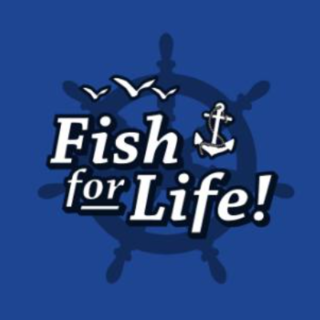 Fish for Life chapters can be anywhere there is fishing! If you are interested in starting a chapter in your area, contact us to learn how to get it started!